On request, websites inform their readers on newly news and ar­ti­cles. Aside from the classical email newsletter (Newsletter, elec­tron­ic mailing list), RSS news tickers (feeds) are highly popular. These in­form you either on all new contributions or specifically only on sin­gle subject areas, on articles (and newly uploaded videos, au­dio files etc. ), or on new reader comments, according to your choice. Basically, RSS is a file being entered regularly new entries, for ex­am­ple, head­lines, teas­ers, extracts or summaries which contain a hyperlink to the whole con­tri­bu­­tion. Complete ar­ti­cles together with hyperlinks and illustrations can also be included in RSS news tickers. How can the reader find out about news on websites? He “subscribes” the single websites be­ing of interest, with a pro­gram. Hereby, for the sake of a better overview, clas­si­fi­ca­tions in self-chosen news categories can be made (Politics, Nutrition, and so forth). From then on, at every start of the program it is checked, if there are RSS newly news. This means, that the news ticker of the concerned websites are actively called up and checked for new entries. The desired update resp. actualization intervals (hourly, half-hourly etc.) can be set in the program settings (preferences). RSS offers advantages for readers as well as for website owners: The reader does not have to reveal an email address any longer, instead, he subscribes actively with the RSS program, but with­out any reg­is­tra­tion: The calling up of a news ticker is done as (relativ) anon­y­mously as the calling up of a website. The website owner does not have to care any longer for elab­o­rate registration processes and for ver­i­fi­ca­tion processes for mailing lists, the provision of a RSS news ticker is completely sufficient. With practically all content management systems and blog software, RSS feeds are fully au­to­mat­ic provided, after the website owner has activated them. For the whole website, for sin­gle articles, and for their comment sections. Video portals like, for example, Youtube, also pub­li­cize automatically RSS news tickers for the single channels. 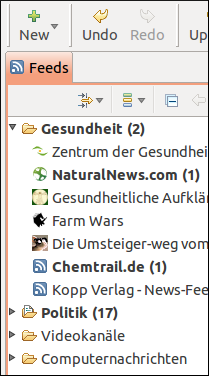 A manually creation by means of RSS editors is al­so possible, for example, with the free “Easy Feed Editor”. Firefox extensions like “Morning Coffee” offer a similar functionality like RSS, by opening sev­er­al websites of a list simultaneously, in separate tabs. However, the reader has to check the site contents for news by himself; there is no automatical compilation of news as with RSS news collectors (aggregators). Besides RSS-Feeds, many websites also publicize RDF- and Atom-​Feeds, for keeping the read­er in­formed. Naturally, modern programs like RSSOwl also master these formats. In today's in­for­ma­tion flood, newstickers are a great help when probing the essential in­for­ma­tion. It is easier, to get news of numerous websites presented bundled and cap­turable at a glance, than having to find them tediously in different website sections. RSS newstickers are also under political aspects an excellent alternative to e-mail dis­tri­bu­tion lists. They enable readers to be informed actively, without risking to miss news due to e-mail censorship: Website owners report again and again that e-mail newsletters on new contributions or appeals can sometimes not be sent or received. Because of the fact, that e-mail providers consider the sender politically as not conform enough. A variety of applications is suited for the reading of RSS, by default or through combination with free extensions: Web browsers, email clients, independent RSS programs (feed readers), or RSS Internet news aggregators. Such services, called news aggregation websites, offer synchronization functionalities (with similar advantages as with the IMAP email protocol) as well as the option, to view all news bundled on a website or within an email. However, they are not explained in more detail, here. Naturally, lists of RSS bookmarks can be exported and imported. First, you have to “fetch” the RSS symbol. Under Firefox you follow the menu path “View” → “Toolbars” → “Customize ...”. Now drag the RSS symbol per mouse click on a menu bar. From now on, the symbol appears whenever a website offers a RSS news ticker (one or sev­er­al), otherwise the symbol is displayed brightly faded out. 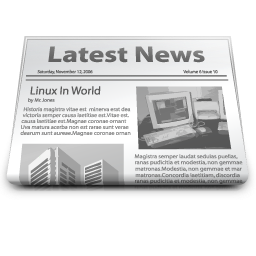 Often, websites offer expressly news tickers within the site area, together with reference sensitive RSS symbols. The following possibilities are at choice: Through clicking on the symbol on your browser menu bar, all “RSS feeds” offered by the website are shown in a list, whereby a selection can be done per mouse click. When pressing, the content of the chosen news ticker is opened, together with the subscription information on top. The address of the news ticker appears at top in the browsers address bar (Mozilla article “Awesome bar [...]”), wherefrom it also can be copied and buffered, for taking it over into other programs. After pressing on “Subscribe”, you are expected to select the folder in which you would like to place the RSS bookmark. Afterwards, confirm with “subscribe”. From then on, you have a RSS bookmark that opens by clicking and shows new contributions for selection. Sometimes, website owners do not integrate information on RSS news tickers in the HTML markup code, so that the RSS symbol appears faded. However, they are maybe offered in an RSS area with­in the website. Alternatively, web browser extensions (see also “plug-in”) can be used as RSS feed readers, like Sage for Mozilla Firefox. However, since the introduction of the highfrequent update cycle it sometimes is uncertain, if an extension still works after an update. Therefore, the use of an independent RSS reader is prefereable. However, even then, when you should read RSS feeds exclusively via your browser, you profit from RSS, as you get presented the latest news at a glance, being able to open them separately. For numerous local email clients (MUAs) are free RSS-​extensions offered, an incomplete selection: RSS with Mo­­zil­­la Thun­der­bird, with MS-​Out­­look (see also “Introduction to RSS”), with Claws-​Mail, with Evo­lu­tion. RSSOwl is a mighty, comfortable and feature rich platform independent RSS reader program. It requires the free (of charge) Java Rundtime Environment, it must be installed first. In the download section of the official RSSOwl website are all language and operationg system versions listed. OpenJDK is not only free of any cost resp. free of any charge like Oracle's Java Runtime En­vi­ron­ment for MS-Windows is. Furthermore, it also is free software under the program code as­pect. RSS-Ban­dit is another efficient free RSS reader program for MS-​Win­dows. It requires the freely available .Net Framework from Microsoft. Users of Unix-like operating systems (BSD/Unix, GNU/Li­nux) have a great choice of free RSS applications which are not dependent on runtime systems. For an overview, type “RSS” into the search field of your package management system, whereupon detailed information appear. Two of several mighty RSS programs: Ak­re­ga­tor und Life­rea.